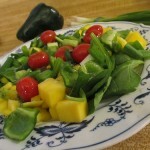 This is a tasty colorful salad made from ingredients containing a variety of plant antioxidants. 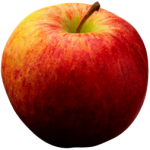 There is a traditional saying in India “A Mango A Day Can Keep Cancer Away”. In modern times we know that mangos contain not only super antioxidant carotenoids, but also lupeol, a phytochemical that induces a process called apoptosis a process which turns on a self destruct switch in all cells, including cancer cells. This Southwestern inspired salad is rich and textured and so nutritious it can serve as a meal in a bowl. 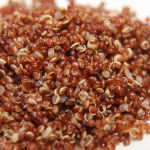 Quinoa is often thought of as a grain, but it is really a seed that originated as a nutrient dense staple food of the Incas in the Andes Mountains of South America. Black beans are rich in iron, fiber and protein and avocados are a wonderful source of super antioxidants, healthy monounsaturated healthy fats and glutathione. Cilantro or fresh coriander leaves contribute not only flavor, but also cell protective super antioxidants beta carotene, quercitin and rutin. 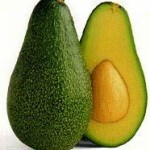 I cannot imagine life without avocados. I grew up with 3 avocado trees in our backyard. Guacamole is made from avocados, one of the most nourishing cancer fighting foods along with the surprise of color and anti-oxidant filled pomegranate seeds. 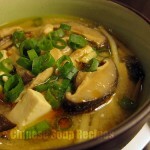 This nutrient rich restorative stew comes from the tradition of making therapeutic medicinal soups and stews with Chinese Tonic herbs. This stew is particularly rich in blood building herbs and foods. 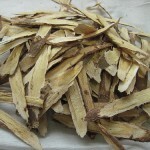 Included are Astragalus (Huang Qi) a potent Qi or Vitality Tonic traditionally used in many anti cancer formulas. Here is a simple easy to prepare colorful salad rich in cancer fighting phytochemicals and super antioxidants.Both watercress and red cabbage are rich in isothiocyanates that improve detoxification and inflammation function. These sulphur rich plant compounds also promote healthy detoxification and metabolism of estrogen and estrogen excretion leading to improved risk profiles for hormonal cancers such as breast cancer and prostate cancer. 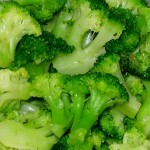 Here is a simple, easy to prepare dish made with two of the top cancer fighting super foods, walnuts rich in healthy oils and broccoli rich in sulphoraphanes. 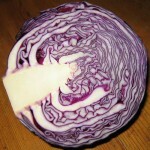 Adding cruciferous cabbage family vegetables is a core part of an anti-cancer diet. 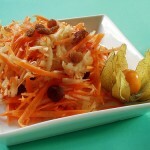 A crunchy colorful alternative to cole slaw and a great way to eat more salad. This colorful easy to prepare fiber rich mix is filled with cell protective cancer fighting antioxidants and bioflavonoids including quercitin, carotenoids, epicatechins, potassium and Vitamin C.
Asparagus is one of nature’s Super Foods. It is one of the few foods rich in glutathione which is nature’s super antioxidant providing a source of powerful protection for our cells and our DNA against oxidative damage by free radical electrons. 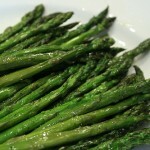 Asparagus also supports normal anti-inflammatory function, crucial to cancer prevention.